Frank Sinatra was arguably the most important popular music figure of the 20th century, his only real rivals for the title being Bing Crosby, Elvis Presley, and the Beatles. In a professional career that lasted 60 years, he demonstrated a remarkable ability to maintain his appeal and pursue his musical goals despite often countervailing trends. He came to the fore during the swing era of the 1930s and '40s, helped to define the "sing era" of the '40s and '50s, and continued to attract listeners during the rock era that began in the mid-'50s. He scored his first number one hit in 1940 and was still making million-selling recordings in 1994. This popularity was a mark of his success at singing and promoting the American popular song as it was written, particularly in the 1920s, '30s, and '40s. He was able to take the work of great theater composers of that period, such as Jerome Kern, Irving Berlin, George Gershwin, Cole Porter, and Richard Rodgers, and reinterpret their songs for later audiences in a way that led to their rediscovery and their permanent enshrinement as classics. On records and in live performances, on film, radio, and television, he consistently sang standards in a way that demonstrated their perennial appeal. The son of a fireman, Sinatra dropped out of high school in his senior year to pursue a career in music. In September 1935, he appeared as part of the vocal group the Hoboken Four on Major Bowes' Original Amateur Hour. The group won the radio show contest and toured with Bowes. Sinatra then took a job as a singing waiter and MC at the Rustic Cabin in Englewood, NJ. He was still singing there in the spring of 1939, when he was heard over the radio by trumpeter Harry James, who had recently organized his own big band after leaving Benny Goodman. James hired Sinatra, and the new singer made his first recordings on July 13, 1939. At the end of the year, Sinatra accepted an offer from the far more successful bandleader Tommy Dorsey, jumping to his new berth in January 1940. Over the next two and a half years, he was featured on 16 Top Ten hits recorded by Dorsey, among them the chart-topper "I'll Never Smile Again," later inducted into the Grammy Hall of Fame. During this period, he also performed on various radio shows with Dorsey and appeared with the band in the films Las Vegas Nights (1941) and Ship Ahoy (1942).In January 1942, he tested the waters for a solo career by recording a four-song session arranged and conducted by Axel Stordahl that included Cole Porter's "Night and Day," which became his first chart entry under his own name in March 1942. Soon after, he gave Dorsey notice. Sinatra left the Dorsey band in September 1942. The recording ban called by the American Federation of Musicians, which had begun the previous month, initially prevented him from making records, but he appeared on a 15-minute radio series, Songs By Sinatra, from October through the end of the year and also did a few live dates. His big breakthrough came due to his engagement as a support act to Benny Goodman at the Paramount Theatre in New York, which began on New Year's Eve. It made him a popular phenomenon, the first real teen idol, with school girls swooning in the aisles. RCA Victor, which had been doling out stockpiled Dorsey recordings during the strike, scored with "There Are Such Things," which had a Sinatra vocal; it hit number one in January 1943, as did "In the Blue of the Evening," another Dorsey record featuring Sinatra, in August, while a third Dorsey/Sinatra release, "It's Always You," hit the Top Five later in the year, and a fourth, "I'll Be Seeing You," reached the Top Ten in 1944. Columbia, which controlled the Harry James recordings, reissued the four-year-old "All or Nothing at All," re-billed as being by Frank Sinatra with Harry James & His Orchestra, and it hit number one in September. Meanwhile, the label had signed Sinatra as a solo artist, and in a temporary loophole to the recording ban, put him in the studio to record a cappella, backed only by a vocal chorus. This resulted in four Top Ten hits in 1943, among them "People Will Say We're in Love" from Richard Rodgers and Oscar Hammerstein II's musical Oklahoma!, and a fifth in early 1944 ("I Couldn't Sleep a Wink Last Night") before protests from the musicians union ended a cappella recording. In February 1943, Sinatra was hired by the popular radio series Your Hit Parade, on which he performed through the end of 1944. Adding to his radio duties, he appeared from June through October on Broadway Bandbox and in the fall again took up the Songs by Sinatra show, which ran through December. 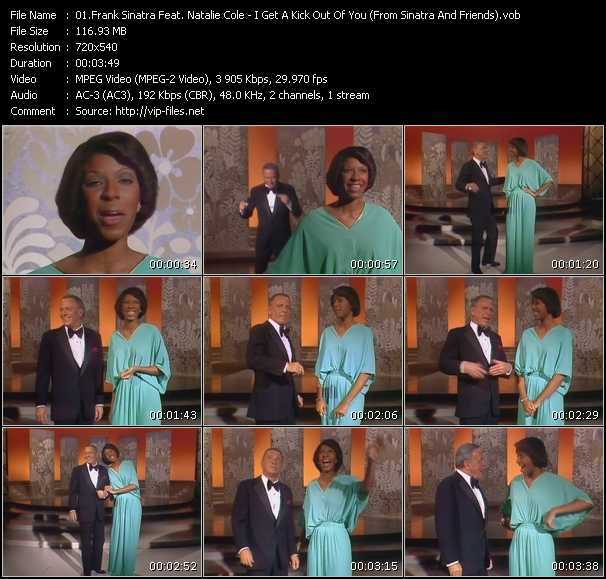 In January, it was expanded to a half-hour as The Frank Sinatra Show, which ran for a year and a half. In April 1943, he made his first credited appearance in a motion picture, singing "Night and Day" in Reveille with Beverly. This was followed by Higher and Higher, released in December, in which he had a small acting role, playing himself, and by Step Lively, released in July 1944, which gave him a larger part. MGM was sufficiently impressed by these performances to put him under contract. The recording ban was lifted in November 1944, and Sinatra returned to making records, beginning with a cover of Irving Berlin's "White Christmas" that was in the Top Ten before the end of the year. Among his eight recordings to peak in the Top Ten in 1945 were Jule Styne and Sammy Cahn's "Saturday Night (Is the Loneliest Night of the Week)," Johnny Mercer's "Dream," Styne and Cahn's "I Should Care," and "If I Loved You" and "You'll Never Walk Alone" from the Rodgers & Hammerstein musical Carousel. Sinatra insisted that Styne and Cahn be hired to write the songs for his first MGM musical, Anchors Aweigh, and over the course of his career, the singer recorded more songs by Cahn (a lyricist who worked with several composers) than by any other songwriter. Anchors Aweigh, in which Sinatra was paired with Gene Kelly, was released in July 1945 and went on to become the most successful film of the year. Sinatra returned to radio in September with a new show bearing an old name, Songs by Sinatra. It ran weekly for the next two seasons, concluding in June 1947. Among his eight Top Ten hits in 1946 were two that hit number one ("Oh! What It Seemed to Be" and Styne and Cahn's "Five Minutes More"), as well as "They Say It's Wonderful" and "The Girl That I Marry" from Irving Berlin's musical Annie Get Your Gun, Jerome Kern's "All Through the Day," and Kurt Weill's "September Song." He also topped the album charts with the collection The Voice of Frank Sinatra. His only film appearance for the year came in Till the Clouds Roll By, a biography of the recently deceased Kern, in which he sang "Ol' Man River." By 1947, Sinatra's early success had crested, though he continued to work steadily in several media. On radio, he returned to the cast of Your Hit Parade in September 1947, appearing on the series for the next two seasons, then had his own 15-minute show, Light-Up Time, during 1949-1950. On film, he appeared in five more movies through the end of the decade, including both big-budget MGM musicals like On the Town and minor efforts such as The Kissing Bandit. He scored eight Top Ten hits in 1947-1949, including "Mam'selle," which hit number one in May 1947, and "Some Enchanted Evening," from the Rodgers & Hammerstein musical South Pacific. He also hit the Top Ten of the album charts with 1947's Songs by Sinatra and 1948's Christmas Songs by Sinatra. Sinatra's career was in decline by the start of the '50s, but he was far from inactive. He entered the fall of 1950 with both a new radio show and his first venture into television. On radio, there was Meet Frank Sinatra, which found the singer acting as a disc jockey; it ran through the end of the season. On TV, there was The Frank Sinatra Show, a musical-variety series; it lasted until April 1952. His film work had nearly subsided, though in March 1952 came the drama Meet Danny Wilson, which tested his acting abilities and gave him the opportunity to sing such songs as Harold Arlen and Johnny Mercer's "That Old Black Magic," "I've Got a Crush on You" by George and Ira Gershwin, and "How Deep Is the Ocean?" by Irving Berlin.At Columbia Records, Sinatra came into increasing conflict with musical director Mitch Miller, who was finding success for his singers by using novelty material and gimmicky arrangements. Sinatra resisted this approach, and though he managed to score four more Top Ten hits during 1950-1951 ( among them an unlikely reading of the folk standard "Goodnight Irene" ) he and Columbia parted ways. Thus, ten years after launching his solo career, he ended 1952 without a record, film, radio, or television contract. Then he turned it all around. The first step was recording. Sinatra agreed to a long-term, boilerplate contract with Capitol Records, which had been co-founded by Johnny Mercer a decade earlier and had a roster full of faded '40s performers. In June 1953, he scored his first Top Ten hit in a year and a half with "I'm Walking Behind You." Then in August, he returned to film, playing a non-singing, featured role in the World War II drama From Here to Eternity, a performance that earned respect for his acting abilities, to the extent that he won the Academy Award for Best Supporting Actor for the part on March 25, 1954. In the fall of 1953, Sinatra began two new radio series: Rocky Fortune, a drama on which he played a detective, ran from October to March 1954; and The Frank Sinatra Show was a 15-minute, twice-a-week music series that ran for two seasons, concluding in July 1955. Meanwhile, Sinatra had begun working with arranger/conductor Nelson Riddle, a pairing that produced notable chart entries in February 1954 on both the singles and albums charts. "Young-at-Heart," which just missed hitting number one, was the singer's biggest single since 1947, and the song went on to become a standard. (The title was used for a 1955 movie in which Sinatra starred.) Then there was the 10" LP Songs for Young Lovers, the first of Sinatra's "concept" albums, on which he and Riddle revisited classic songs by Cole Porter, the Gershwins, and Rodgers and Hart in contemporary arrangements with vocal interpretations that conveyed the wit and grace of the lyrics. The album lodged in the Top Five. In July, Sinatra had another Top Ten single with Styne and Cahn's "Three Coins in the Fountain," and in September Swing Easy! matched the success of its predecessor on the LP chart. By the middle of the '50s, Sinatra had reclaimed his place as a star singer and actor; in fact, he had taken a more prominent place than he had had in the heady days of the mid-'40s. In 1955, he hit number one with the single "Learnin' the Blues" and the 12" LP In the Wee Small Hours, a ballad collection later inducted into the Grammy Hall of Fame. On September 15, 1955, he appeared in a television production of Our Town and sang "Love and Marriage" (specially written by Sammy Cahn and his new partner James Van Heusen), which became a Top Five hit. Early in 1956, he was back in the Top Ten with Cahn and Van Heusen's "(Love Is) The Tender Trap," the theme song from his new film, The Tender Trap. As part of his thematic concepts for his albums of the '50s, Sinatra alternated between records devoted to slow arrangements (In the Wee Small Hours) and those given over to dance charts (Swing Easy). By the late winter of 1956, the schedule called for another dance album, and Songs for Swingin' Lovers!, released in March, filled the bill, stopping just short of number one and going gold. The rise of rock & roll and Elvis Presley began to make the singles charts the almost-exclusive province of teen idols, but Sinatra's "Hey! Jealous Lover" (by Sammy Cahn, Kay Twomey, and Bee Walker), released in October, gave him another Top Five hit in 1957. Meanwhile, he ruled the LP charts. The Capitol singles compilation This Is Sinatra!, released in November, hit the Top Ten and went gold. Sinatra began 1957 by releasing Close to You, a ballad album with accompaniment by a string quartet, in February. It hit the Top Five, followed in May by A Swingin' Affair!, which went to number one, and another ballad album, Where Are You?, a Top Five hit after release in September. He was also represented in the LP charts in November by the soundtrack to his film Pal Joey (based on a Rodgers & Hart musical), which hit the Top Five, and by the seasonal collection A Jolly Christmas From Frank Sinatra, which eventually was certified platinum. The Joker Is Wild, another of his 1957 films, featured the Cahn-Van Heusen song "All the Way," which became a Top Five single. 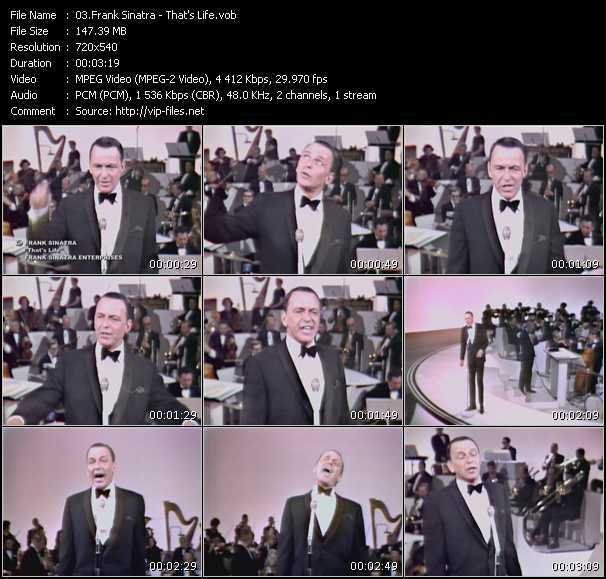 In October, he returned to prime time television with another series called The Frank Sinatra Show, but it lasted only one season, and subsequently he restricted his TV appearances largely to specials (of which he made many). In February 1958, Sinatra reached the Top Ten with "Witchcraft," his last single to perform that well for the next eight years. That month, Capitol released Come Fly with Me, a travel-themed rhythm album, which hit number one. The year's ballad album, Frank Sinatra Sings for Only the Lonely, released in September, also topped the charts, and it went gold. In between, Capitol released the compilation This Is Sinatra, Vol. 2, which hit the Top Ten. 1959 followed a similar pattern. Come Dance With Me! appeared in January and became a gold-selling Top Ten hit. It also won Sinatra Grammy Awards for Album of the Year and for vocal performance. Look to Your Heart, a compilation, was released in the spring and reached the Top Ten. And No One Cares, the year's ballad collection, appeared in the summer and just missed topping the charts. Sinatra gradually did less singing in his movies of the '50s, but in March 1960, he appeared in a movie version of Cole Porter's musical Can-Can, and the resulting soundtrack album hit the Top Ten. Meanwhile, Sinatra was beginning to think about the approaching end of his Capitol Records contract and to enter the studio less frequently for the company. His next regular album was a year in coming, and when it did, Nice 'n' Easy was a mid-tempo collection, breaking his pattern of alternating fast and slow albums. The wait may have caused pent-up demand; the album spent many weeks at number one and went gold. Although Sinatra had not yet completed his recording commitment to Capitol, he began in December 1960 to make recordings for his own label, which he called Reprise Records. As a result, record stores were deluged with five new Sinatra albums in 1961: in January, Capitol had Sinatra's Swingin' Session!!! ; in April, Reprise was launched with the release of Ring-a-Ding Ding! ; in July, Reprise followed with Sinatra Swings the same week that Capitol released Come Swing with Me! ; and in October, Reprise had I Remember Tommy..., an album of songs Sinatra had sung with the Tommy Dorsey band. There was also the March compilation All the Way on Capitol, making for six releases in one year. Remarkably, they all reached the Top Ten. Meanwhile, Reprise's first single, "The Second Time Around," a song written by Cahn and Van Heusen for Bing Crosby, won Sinatra the Grammy for Record of the Year. By 1962, the market was glutted. Capitol released its last new Sinatra album, Point of No Return, as well as a compilation, and Reprise put out three new LPs, but only Reprise's Sinatra & Strings reached the Top Ten. In 1963, however, all three Reprise releases, Sinatra-Basie, The Concert Sinatra, and the gold-selling Sinatra's Sinatra, made the Top Ten. The onset of the Beatles in 1964 began to do to the LP charts what Elvis Presley had done to the singles charts in 1956, but Sinatra continued to reach the Top Ten with his albums of the mid-'60s, albeit not as consistently. Days of Wine and Roses, Moon River, and Other Academy Award Winners hit that ranking in May 1964, as did Sinatra '65 in August 1965. That same month, Sinatra mounted a commercial comeback by emphasizing his own advancing age. Nearing 50, he released September of My Years, a ballad collection keyed to the passage of time. After "It Was a Very Good Year" was drawn from the album as a single and rose into the Top 40, the LP took off for the Top Five and went gold. It was named 1965 Album of the Year at the Grammy Awards, and Sinatra also picked up a trophy for best vocal performance for "It Was a Very Good Year." 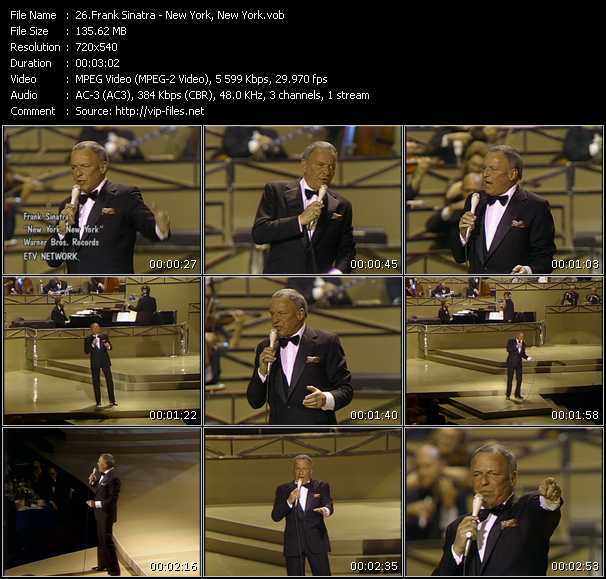 In November 1965, Sinatra starred in a retrospective TV special, A Man and His Music, and released a corresponding double-LP, which reached the Top Ten and went gold. It won the 1966 Grammy for Album of the Year. Sinatra returned to number one on the singles charts for the first time in 11 years with the million-selling "Strangers in the Night" in July 1966; the song won him Grammys for Record of the Year and best vocal performance. A follow-up album named after the single topped the LP charts and went platinum. Before the end of the year, Sinatra had released two more Top Ten, gold-selling albums, Sinatra at the Sands and That's Life, the latter anchored by the title song, a Top Five single. In April 1967, Sinatra was back at number one on the singles charts with the million-selling "Somethin' Stupid," a duet with his daughter Nancy. By the late '60s, even Sinatra had trouble resisting the succeeding waves of youth-oriented rock music that topped the charts. 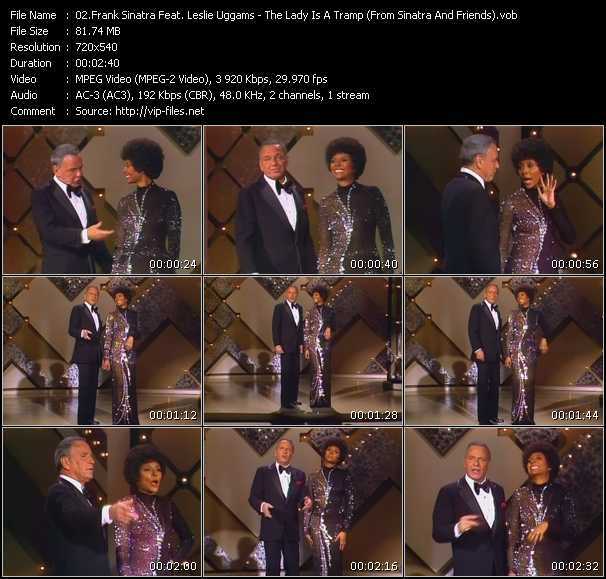 But Frank Sinatra's Greatest Hits!, a compilation of his '60s singles successes released in August 1968, was a million-seller, and Cycles, an album of songs by contemporary writers like Joni Mitchell and Jimmy Webb, released that fall, went gold. In March 1969, Sinatra released "My Way," with a lyric specially crafted for him by Paul Anka. It quickly became a signature song for him. The single reached the Top 40, and an album of the same name hit the Top Ten and went gold. In the spring of 1971, at the age of 55, Sinatra announced his retirement. But he remained retired only until the fall of 1973, when he returned to action with a new gold-selling album and a TV special both called Ol' Blue Eyes Is Back. 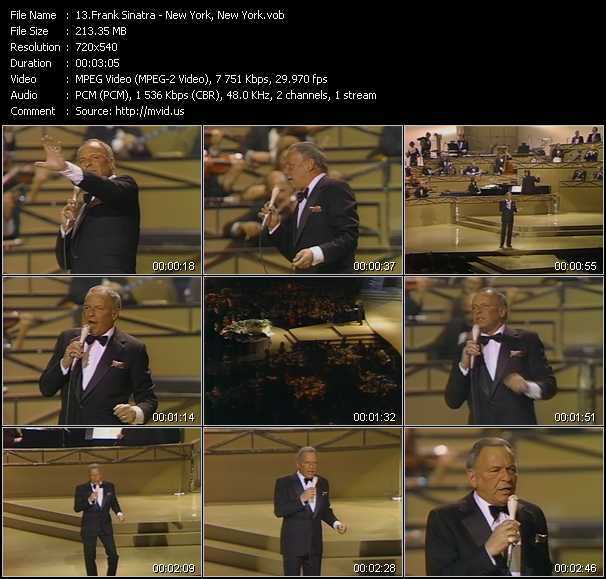 In this late phase of his career, Sinatra cut back on records, movies, and television in favor of live performing, particularly in Las Vegas, but also in concert halls, arenas, and stadiums around the world. He refrained from making any new studio albums for six years, then returned in March 1980 with a three-LP set, Trilogy: Past, Present, Future. 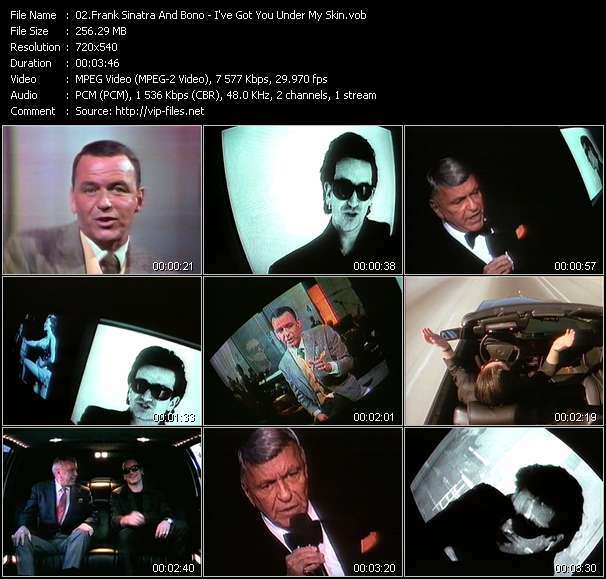 The most memorable track from the gold-selling set turned out to be "Theme From New York, New York," the title song from the 1977 movie, which Sinatra's recording belatedly turned into a standard. By the early '90s, the CD era had inaugurated a wave of box set reissues, and the 1990 Christmas season found Capitol and Reprise marking Sinatra's 75th birthday by competing with the three-disc The Capitol Years and the four-disc The Reprise Collection. Both went gold, as did Reprise's one-disc highlights version, Sinatra Reprise -- The Very Good Years. Sinatra himself, meanwhile, while continuing to tour, had not made a new recording since his 1984 LP L.A. Is My Lady. In 1993, he re-signed to Capitol Records and recorded Duets, on which he re-recorded his old favorites, joined by other popular singers ranging from Tony Bennett to Bono of U2 (none of whom actually performed in the studio with him). It became his biggest-selling album, with sales over 3,000,000 copies, and was followed in 1994 by Duets II, which won the 1995 Grammy Award for Traditional Pop Performance. Sinatra finally retired from performing in his 80th year in 1995, and he died of a heart attack less than three years later. Anyone will be astonished at the sheer extent of Sinatra's success as a recording artist over 50 years, due to the changes in popular taste during that period. His popularity as a singer and his productivity has resulted in an overwhelming discography. Its major portions break down into the Columbia years (1943-1952), the Capitol years (1953-1962), and the Reprise years (1960-1981), but airchecks, film and television soundtracks, and other miscellaneous recordings swell it massively. As a movie star and as a celebrity of mixed reputation, Sinatra is so much of a 20th century icon that it is easy to overlook his real musical talents, which are the actual source of his renown. As an artist, he worked to interpret America's greatest songs and to preserve them for later generations. On his recordings, his success is apparent.